One of the decisions that you’ll have to make early on if you’re starting a small group is where are you going to host it? There’s a lot of options that you can use and all of them have pros and cons. So I want to talk just a minute about some good options if you’re looking at starting a small group, especially offsite from where your church is. The first natural one is your home. Now, home is a great place to have a small group. It feels comfortable. It’s easy to build community in, but there are some things that you want to think about when you think about your home and whether it might be good for your small group. The first thing is how big is it? Because if you’re going to have a large, small group, and I’m talking more than like 12, you know if you’re going to have 16, 18 people in your small group, you want to make sure that you have room in your living room or somewhere in the house where everyone can comfortably sit in a circle, see each other, hear each other, and feel like they’re in community at your house. If they’re having to spread out or sit behind people, that’s going to be less viable than if they could sit in a circle and see everybody in the group. So you want to make sure that your home is big enough and you’ll also want to think about childcare. If you’re going to have a group with small kids like parents with younger kids, you want to make sure that there’s somewhere in the house that you can comfortably have childcare, that the kids can have a safe time and it’s a good place for them to be during the group. So home is a great place for your small group, but there are also some other options. A few of them are a neighborhood clubhouse. If you live in a neighborhood that has a clubhouse, a lot of times they sit empty during the week, especially at apartments, so you might look into maybe being able to rent it for a small fee. A lot of times it’s just a fee to cover the cleaning costs, but uh, that might be a good option for you. But the downside is if you have childcare, you need childcare, that’s not always a good good place because it’s easily just one room. So, but you might look at a neighborhood, a clubhouse. Also maybe a room at the church building. Maybe your church allows groups to use Sunday school rooms or rooms at the church during the week. And that’s a great option, especially if they’ll let you use another room for childcare again. Um, but also it kind of limits some of the community that can happen during the small group, especially if you’re going to provide food. Because not all church rooms are good for that. And it’s also not always a great place just to hang out. So that’s kind of a downside to using a room at the church. You might also be able to use a break room at the office. A lot of offices will allow a Bible study to go on during a break time, but you want to make sure that you clear that with the people at your office. It also allows you to invite people to your group that may not naturally want to come to your home or church or to a room at the church. So that’s another good option. And then a final one is a third space somewhere like a coffee house or something like that. That’s a good place to have, especially if you have a smaller group like 5 to 10 because you can go into a coffee house and sit around a table or a group of chairs and easily be able to have a discussion. Now that’s a tougher place if you’re going to have a larger group, if you’re going to have more than 10, you might look at some other options. So those are just a few places that you can have your group. All of them have pros, they have cons, but take a look at those as you start your small group. Chris Surratt is a ministry consultant and coach with more than twenty years of experience serving the local church. Chris served on the Executive Teams at Cross Point Church in Nashville, TN., and Seacoast Church in Charleston, S.C., prior to becoming the Discipleship and Small Groups Specialist for LifeWay Christian Resources. He is the author of Small Groups for the Rest of Us: How to Design Your Small Groups System to Reach the Fringes. You can follow his blog at www.chrissurratt.com. One of the churches in which I serve sat in an interesting place geographically. Now on our side of the street it was beginning to change. There were homes being flipped, it was gentrifying, it was quickly becoming a place that you wanted to live. But directly across the street was a completely different story. There were a lot of gangs and drugs and violence and it was not a place that you wanted to be. Now a couple of our small groups decided to make a difference in that community. They begin to go over one time a month and just love on one block at a time. They took basic needs, batteries and light bulbs and toilet paper and just knocked on doors and just loved that community. And slowly over time that community began to change because of those small groups. Eventually that led to what we call a dream center, a 24/7 dream center that had legal services, had a food pantry, had ministries for single moms and became a bright light in that dark place. So how do you help your small group get there? How do we eventually change our community and change our world? Let me give you four steps to help your group become a serving group. Step one is you’ve got to serve your group first. If you expect your small group to become a serving group, you have to first model servant leadership for your group members. You know Paul gave these instructions to the church in Philippi. He said, do nothing out of selfish ambition or conceit, but in humility, consider others as more important than yourselves. Everyone should not look out only for his own interest, but also for the interest of others. Adopt the same attitude is that of Jesus Christ. Jesus left us the ultimate example of servanthood as he served his disciples and ultimately all of us on the cross, so serve your group first. Do it by a washing their car, watching their kids so they can go out for dinner, but look for tangible ways that you can serve your group, first. Second step is empower group members to serve the group. You’re discipling your group members by helping them discover their spiritual gifts in order to utilize with them within the group. So look for opportunities for others to host the group or maybe provide the food or facilitate the discussion or maybe handle the prayer time or look for missional opportunities outside of the group, but find out where your group members are gifted, where their spiritual gifts are and then help them serve the group. Step number three is served together in the church. You know, there’s always opportunities for us to serve at our church. Maybe it’s some landscaping or a wall needs to be painted in a classroom or maybe serve in a classroom to give those teachers a break on a Sunday, but look for somewhere that you can serve together in the church. And then number four is serve together in the community. Just like our small groups saw need directly across the street from where we were, there are needs in your community. So look outside of the walls where you meet every single week. Maybe there is an elementary school that needs supplies in the fall, or maybe there’s a single mom that just simply needs her lawn mowed. Look around, there’s needs in your community and gather your group and let’s serve those needs. So four steps. Serve your group first, empower your group members to serve, serve together in the church and serve together in the community. If you follow those, someday, your group will change the world. So we’re talking about shaping the culture of your small group, making sure that the culture of the framework of your group is Gospel centered. So I want to look at one aspect of Gospels centrality in your group with hospitality. So when you think of the word hospitality, what comes to mind? For me, I think about Martha Stewart, the front of a glossy magazine. Everything’s perfect. Everything’s laid out perfectly. The food’s going to taste great, but then I think it’s just not me. I just don’t have the gift of hospitality. I don’t think that’s the complete picture of what hospitality is. If you read, especially the New Testament, there’s a lot of references to being hospitable. I mean, if you look at first Peter 4:9says, be hospitable to one another without complaining. Romans 12:13 says, share with the saints and their needs. Pursue hospitality. So it’s obviously important. It was so important that Paul listed it as a qualification for being an elder or a deacon. So how do we do that? How do we pursue hospitality? Well, if you look at the original word, the Greek word for hospitality, it actually means two words, love and stranger. I think that’s a powerful description of what the Gospel is. You know when we were strangers and aliens, God took us in when we didn’t have a home or a family, God brought us into his. When we were without hope in the world, God adopted us as his children and with the ultimate gift of hospitality, ultimate act of hospitality God gave us his son, Jesus Christ, to die on the cross for us, and Jesus epitomized hospitality. Everywhere he went, he didn’t even have a home or casserole dishes or any of that, but he welcomed people into his life. So how do we do that? Some practical ways to show hospitality in your group. First, just be open to inviting strangers into your group. Having that love of strangers, people that you meet, that need the community that you’re offering, invite them to be a part of it. Also, remember that everything speaks when it comes to the environment of your small group, so make sure there’s a smiling face at the door. There’s a welcoming attitude when it comes to your small group. Also be first the first to serve and the last to eat. Something just as basic as waiting for everyone else to eat before you do and then being the first one to serve other group members when there’s a need in the group, and then finally pray consistently for the group. Sometimes we forget that, but that’s where hospitality begins is with prayer, so let’s make sure that the hospitality part of our group is Gospel centered. I don’t know about you, but there’s this near paralyzing fear comes when I think about true authenticity. You know those thoughts that bombard us when we start to grow in relationships with others. If people only knew the things I’ve done in my past, my shortcomings as a spouse or my failure as a parent, my sin based in my insecurities, but the Christian community has a unique answer to all of these hesitations. As Christians, we have the opportunity to present not a persona but our authentic selves to others in our small group, but we can only be truly authentic with each other and even the outside world through a deep belief in the Gospel because the Gospel reminds us that Jesus is fully and completely bore our sin because Jesus bore our sin, we can live in the freedom of being in right standing with God. We can day by day live with the full knowledge that we are the righteousness of Christ untainted by sin and welcomed into the family of God and amazingly even today when you and I sin and we will, we can know that Jesus bore that sin as well. The Bible has a picture of this authentic transparency. It’s found in James 5:16 where he says, therefore, confess your sins to one another and pray for one another so that you may be healed and this verse is transparency at its best. It’s the picture of someone who convinced the limitless grace and promise forgiveness of Jesus confesses their sin. They lay themselves open and bear before others. Not expecting shame and guilt, but expecting healing. Our naturally reaction to sin is to run and hide in the darkness, but the power of the gospel frees us to come out into the light. The work of Jesus makes confession and repentance more beautiful than burdensome. We can truly share that below the line of shame because we already know that we are so broken that Jesus had to die for us, but we also know that were so loved that he was willing to die for us. So how do we do this with our small group? Let me give you five tips for being truly authentic with your small group. First, be willing to go first. You know, a good practice of facilitation is usually ask a question and then wait for others to jump in before you give the answer, but there may be times where you want to go first, share something from your life and set the example for others in your group. Two, be prepared before the group meeting. 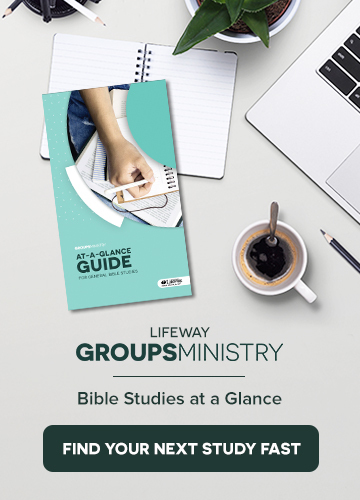 Go through the study know the question so you can know those opportunities where you might be able to share something from your life and kind of help set that example for the rest of the group to follow. Number three, know you should ease into the personal questions. Sometimes we can go there too fast, especially if this is a new group. It’s going to take some time for them to jail before they’re ready to completely open, open themselves up to the people around them. Number four, keep the focus on Jesus and grace. Continue to point the group back to the message of the cross. Authenticity will come when we think about that amazing love that Christ has for us by laying down his life for our sin. So always point the group back to Jesus and grace. And then number five, make prayer integral part of the group experience. You know, sometimes we can forget about the prayer time or kind of rushed through it, but really prayer sets the stage for true authenticity and healing in our group. So following those five practices will lead to the kind of authenticity that brings healing and grace to your group members. Today I want to talk about shaping the culture of your small group. You know, every environment that we find ourselves in has a culture. Kind of those unwritten rules or laws that we all abide by when we’re in that environment. For instance, your work place has a culture. There’s a certain way that you behave, how you interact with people at work and that becomes the culture of your workplace. Our homes have a culture. The way that we act in our homes, where we behave in our environment is just the natural culture of the unwritten laws, rules of our homes. Well, our small groups have a culture as well. Now, culture is kind of like the rebar of a building when it’s being constructed and if you were to go by a building when it’s first getting started, you might see these steel poles that are in the building and that’s the rebar and that’s the framework for that building, but we don’t go by a building at that stage and admire it and say, that’s gonna be a beautiful building! I can tell by the rebar! No, we wait until it’s built out and the outside gets on and then we admire it. But if the rebar wasn’t there, that building would eventually collapse. So that’s the same thing when it comes to our small groups. What is the culture? What is the rebar? What is the framework of your small group? It’s either Gospel centered or it’s not. So if we recognize this fact, we should take on an active role in culture formation in our small group and we should be concerned that the gospel is not merely a message that we talk about, but it’s actually providing the underlying framework for everything that we do in our group life. That it infiltrates our thoughts and our beliefs and consequently our groups so deeply that even the normal aspects of what we do together in our group takes on a different kind of significance and meaning. And that’s being gospel centered with our culture. So over the next few weeks with Tuesday thoughts, I’m going to break that out and look at how do we take each aspect of the culture of our group and make sure that it’s gospel centered. Ok we’re having a discussion about the EGR’s in your small group. And remember, EGR stands for extra grace required. Those are just people in your group who may take up a little bit more of your time, a little bit more of your patience, and they’re just more difficult to lead than the rest of the members and we also call these the four D’s. I’ve got the Dominator. That’s someone who dominates the conversation. The opposite of the dominator, it’s the Dodger. That’s someone who never enters into the conversation. And then the Debater, somebody who always wants to debate the issues. And then finally, what I want to talk about today is the Drainer. What do you do if you have somebody in your group that always turns it back to themself that never is excited, never has joy. We call them Debbie Downers. What do you do if you have a Debbie Downer in your group? Well, there’s a few things that you can do that might help this person have more joy, more life, and be a bigger part of the group. The first thing that I would do is meet with that person outside of the group time because you probably don’t know their story and it’s hard for them to really share their story during the group time. So meet with them for coffee or after a service and just ask them to tell you their story and find out what is feeding into what is going on in their life because there might be something that you can help with that you can pray with them about that you don’t even know about. So meet with them outside of the group time. The second thing that you might want to do is when it comes to the prayer time, that’s usually a time for somebody like this that can kind of turn it always towards their issues, their problems. Especially if you do verbal prayer requests. So instead of doing it verbally, maybe try having people write down their prayer requests on a note card and then either praying silently or sending it out during the week so the group can pray that way. And then finally there may be somebody in your group who needs professional care. They may have needs or issues that’s beyond the abilities of the group, so make sure that you talk to a pastor, talk to a church staff member about how you can refer them to the help that they need. So if you have a drainer that’s okay. There’s some things you can do to help them and help the group. Okay, we’ve talked about the three distinctions of a biblical small group. Number one, are we creating disciples in our small group? Number two, are we experiencing community because we know that discipleship happens best within the context of community? Then number three is our small group on mission? Are we making a difference in the world that we find ourselves in and so today I want to focus on community. How do we ensure that community is happening with our small group? I think we have to be intentional in two ways. The first one is in our schedule with our group meeting. So as you schedule out your actual meeting, you want to look at the different segments and the first part of the group you want to make sure you have time set aside for community. So about 20 to 25 minutes of just hanging out, getting to know each other, maybe have a snack or dinner food of some sort. Just to give the group the chance to have community at the beginning of the group time. And then after that you’re going to have your study, which is going to be about 40 to 45 minutes, but then you want to set aside the end of the group time, another 20 to 25 minutes for more community building. And a lot of times this is when the best conversations are going to happen. So someone who didn’t want to speak up during the Bible study might find somebody during this last segment when you’re having dessert, just hanging out to ask that critical question that leads to discipleship. And so make sure that you’re intentional with your group meeting. Schedule the built in times for community. And then second scheduling times on your calendar for community. So as you set up kind of your calendar days to meet, make sure that about once a semester or once a quarter that you have at least one day just for community. So that means you can even do like a game night or get outside of the house or the room where you meet and have a picnic together. Go to the zoo or just do something fun that makes sure there’s community built into your calendar, into your schedule, so schedule it into your meetings and then put it on your calendar and let’s make sure we have community in our small group. Okay, today I want to talk about having a purpose for your small group. Your small group can be about a lot of things and if we’re not careful, they can just become social clubs and not have a purpose that’s different from any other group that people can be a part of. So what are those distinctions that set your group apart from anything else that people can join in the world? I think we can find three specific distinctives when we look at the early church and the small group that they formed in acts. So if you look at acts 2:42 through 47, we can see three purposes jump out at us. It says they devoted themselves to the apostles teaching, to the fellowship, to the breaking of bread and to prayer. Everyone was filled with awe and many wonders and signs were being performed to the apostles. Now all the believers were together and held all things in common. They sold their possessions and property, distributed the proceeds to all as any had need. Every day they devoted themselves to meeting together in the temple and broke bread from house to house. They ate their food with joyful and sincere hearts, praising God and enjoying the favor of all the people. Every day the Lord added to their number, those who were being saved. And so as we look at this passage, I think we can see three distinctives that they had that all our groups should have. And so the first one that our group should be about is creating disciples. They were creating disciples. It was about discipleship. If you look, they were devoted to the teaching of the apostles. So how is your group creating disciples? Are you doing a study that’s kind of setting up those conversations that’s leading to discipleship? Second, they were living in community. It says that they went from house to house, that they broke bread together. They did life together. So how is your group doing that? How are they in community? Are you just about the study or are you actually doing life together? Breaking bread, having fun. And then third, they were on mission. It says that they sold their possessions and they distributed to anyone who had need to. How is your group on mission? Are you making a difference in the culture that you are in? Are you making a difference in the community, in the neighborhood? Are you reaching out beyond the four walls that you have your meetings? So look at those three things. Are you creating disciples? Are you in community? And finally, are you on mission? Does your group have a purpose?